With the prevalence of 3D movies, even YouTube serves 3D videos. But as time goes on, many feedback reveals the playback issue of YouTube 3D videos. For example, a person reported in Sony community that he couldn’t play downloaded YouTube 3D video on his Sony BRAVIA 3D TV for there is neither control to select the 3D viewing method nor resolution option while the default resolution is rather low. The Sony support team answered him: “The images and videos on the YouTube 3D gallery require the use of red and blue anaglyph 3D glasses. But the glasses designed to be used with a Sony High Definition (HD) BRAVIA 3D TV are not anaglyph. You will have to purchase 3D anaglyph glasses from a local retailer or from the Google store to watch the YouTube 3D videos on a Sony 3D TV.” Even more, although most of the YouTube 3D videos downloaded are MP4 format, there are still have many exceptions, like 3D FLV, video which can’t be supported by Sony 3D TV. So if you don’t have a anaglyph 3D glasses and don’t want to pay for a new one, or your downloaded 3D YouTube video has format incompatibility issue with your Sony 3D TV, what you should do to achieve the playback of YouTube 3D video on Sony 3D TV? Then, here comes video conversion technique. You can use aPubsoft Video Converter to change YouTube 3D video to Sony 3D TV supported 3D SBS MP4/MKV/AVI video, so that you can freely watch YouTube 3D videos on Sony 3D TV without needing anaglyph 3D glasses. it enables you to adjust the video resolution in profile settings like resetting the video parameters to 1080p to get better YouTube 3D video playback on Sony 3D TV. 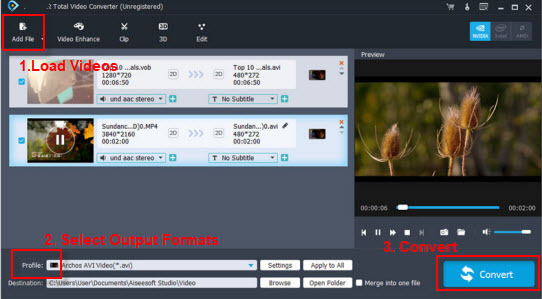 If you are a Mac user, you can try aPubsoft Video Converter for Mac. How to convert YouTube 3D video to 3D SBS MP4 for Sony 3D TV? Install and launch aPubsoft Video Converter as the best YouTube 3D Video Converter on your computer, and click the “Add File” button to YouTube 3D videos to it. Batch conversion feature allows you to import multiple YouTube 3D videos to convert. To export 3D SBS MP4 for Sony 3D TV, you can choose “MP4 Side-by-Side 3D Video(*.mp4)” under “3D Video” category. In this category, it has other 3D format, like 3D MKV, MOV, etc. So you also can choose output 3D MKV for your Sony 3D TV. Tip: To get 1080p YouTube 3D video for Sony 3D TV, you you can click “Settings” button to adjust video size to “1920×1080” to get the better video quality. When ready, you can click the “Convert” button to convert YouTube 3D video to 3D SBS MP4 for playing on Sony 3D TV with best video quality. After YouTube 3D video to 3D SBS MP4 conversion finished, you can hit “Open Folder” button to locate the 3D SBS .mp4 videos. Then, transfer the 3D SBS .mp4 videos to Sony 3D TV for playing. Tip: If you’re planning to rip Blu-ray/DVD to 2D/3D SBS MP4 for Sony 3D TV on Windows 10/8/7 PC, you can get help from an all-in-one tool aPubsoft Blu-Ray/DVD Ripper.